If you have mobile devices like your smartphone, or you have a laptop, you probably run a wireless network. Concrete, bricks and metal will limit the range of your WiFi signal. Installing one or more WiFi repeaters guarantees a strong signal, but does not guarantee high speed. Here is why. 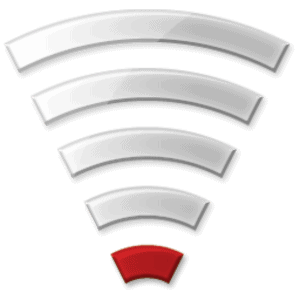 The signal strength of a WiFi router decreases as the range extends and more obstacles block the signal. Because data packages are lost in the static, the data transfer speed reduces as data packages are resend. A 25 Mbit signal will be easily reduced to a few Mbit on the first and second floor of a building or your home. When you install a WiFi repeater, the device picks up the transmitted data package, and re-sends it. However the signal strength increases, the network speed does not increase. The repeater can only resend as much data as it receives: If the transfer speed of the main router is 2 Mbit at the location where the repeater is installed, it can only repeat the received 2 Mbit. Your signal may be strong, but the low transfer speed means a poor internet connection. Solution is to install repeaters at a location with relative high transfer speeds. You can test this with the Ookla Speedtest app for your smartphone or tablet. Try a location where the WiFi repeaters can actually “see” your main router. But what if that location does not provide the necessary signal strength and network speed at the desired location in the building? There is only one reliable solution, use extra acces points with wired connection to your router. Almost any wifi router can be configured as an access point. When you connect an access point with network cable to your main router, it will receive data at the maximum possible speed. If your internet connection is 60Mbit downlink, the access point will be “fed” with 60Mbit. The WiFi signal from the access point will always have the maximum supply of data. The only thing is that you have to run a network cable (Cat.5 or better) from acces point to the main router. If you consider buying devices for power line communication (PLC or also known as homeplug) that uses a building’s power lines, I strongly recommend not to use these. In practice the transfer rates of these homeplugs are only a fraction of what is claimed, often dropping below 10Mbit. These homeplugs send quite some high frequency radio signal over power lines. These power lines will act as huge antennas. Homeplugs are notorious for causing radio interference on your home devices. But also interference on radio frequencies used by aviation, emergency services, army, broadcast services and radio amateurs. Got WiFi problems? Don’t ask an IT guy, ask a radio amateur who is an IT guy. This entry was posted in Blog and tagged home plug, PLC, repeater, WiFi by Jean-Paul Suijs - PA9X. Bookmark the permalink.